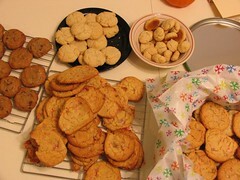 a ton of baked goods. i barely even got out of bed friday. i watched harry potter and the order of the phoenix (also, did you guys all see this?) and chugged oj and took dayquil since i caught zachary's cold. i'm still not feeling quite up to par. my sleep schedule is all screwed up since i've been taking naps because i'm so desperately exhausted. when i did get up friday night, i cleaned up the craft room a bunch. i still have a lot to tackle, but i'm getting there. leslie stayed with us on friday night and saturday afternoon, ginny came over too and we all baked cookies, had some cocktails (baci balls is what boehms calls them, i think) and once done, lcb, sei jin, gavin, zachary and i headed to jerry's to eat. we didn't get a waiter for about 20 minutes. i nearly walked out. god that place is so good, but the service is rarely great. last night z and i watched tommy. he'd never seen it before. man, i've seen that movie tons of times, but it had been awhile. wow, things get crazy up in there. this morning z and i went to april 7's to change the frame for his tom waits piece because the frame i had picked out was expensive. we saved $100 on the one he chose. the way i was rationalizing it was because we'd have the pieces the rest of our lives. i had also brought in the stanley donwood print and the drawing of the moon that i had bought from susie ghahremani. anyways, we spent big bucks, but i think they will look super fantastic. after we left the frame shop, we met kirstie, jason, and gavin for all you can eat sushi at sushi para II. i came home and promptly took a m-fing nap because i was full and exhausted. i wrapped presents while we watched 'my brilliant career'. p.s. if i have ever owed you something in the mail, be on the lookout, friends. i'm even looking your way, norway. i mailed 11 packages on saturday. christmas cards are going out tomorrow. who i sent them to was all over the map, just so you know. i didn't go off my list at all and kind of winged it. i just wanted to get things done since the cards were lost and we found them tonight in my craft room under a stack of stuff. aww, i'm honored you're framing my painting! 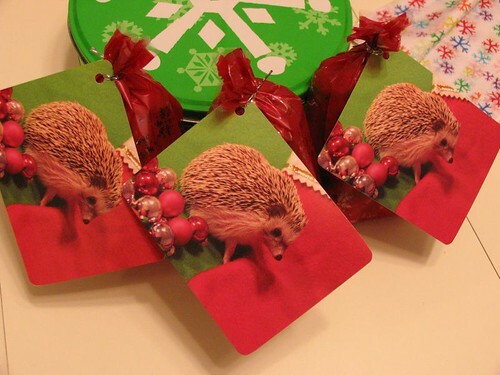 and, those are great hoggleday (holiday) gift tags. adorable! yeah, i think even after shipping from giant robot, the framing cost $10 more than the painting did (i could not remember if it was a painting or a drawing) since it's in b&w. i picked out a really awesome silver frame and at first they wanted to float it, but we ended up choosing a different shade of white as a matte. i will post pictures once they are done. i told them no rush and it'll be about 3 weeks until we get them back. phew! 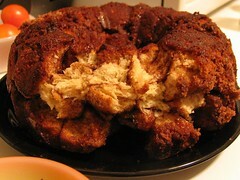 i almost bought some monkey bread last night. yours looks WAY better!